I can be quite wordy at times, and other times it seems I have little or nothing to say. Ever notice that? 🙂 Life events affect me that way. This post will be brief but I hope it holds something of interest, however strange, for you. Today is the birthday of my beloved father-in-law who has been gone over a year now. It’s hard to understand the passing of time, isn’t it? Sometimes it’s difficult to deal with what life brings our way, but I find the Lord gives what we need at the time. More recently, a week ago a very dear friend passed into Glory, a man who, two evenings a week, spent time playing cribbage with my dad into the late hours. He is greatly missed as he was a very caring friend, well thought of and loved by a great number of people. Those loved ones, although absent from our lives, impacted us in positive ways. It’s good to remember them. Since it’s Hallowe’en weekend coming up, All Hallows Evening on October 31, I found an article that should curl your hair, or make it stand on end, or cause you to shudder – or perhaps all of those. Click here for this actual true story that happened in 1705. Tomorrow my husband and I are going on a weekend trip, a brief vacation, something very rare for us. If it weren’t our 40th anniversary on October 3o we wouldn’t be going even now for this much needed break. Family members are keeping a close eye on things for us and taking care of my little Meyya. We’ll be back before October 31. Oh, and here are some pictures of my “little stinker” ready to welcome Trick-or-Treaters. Do you have plans for Hallowe’en weekend, or do you prefer to not get involved? Have you heard other strange stories as I mentioned above? There are many. As you know, Sue Harrison is a generous contributor to my blog, sharing her wisdom and experience as an international best-selling novelist. Her “Writing the Third Dimension” posts are informative, helpful, and appreciatively anticipated each month. Sue has also been a longtime caregiver of her elderly family members. The circle of life brings us all the way around to taking care of the ones who cared for us, and on it goes. Recently she has had more help, which is such a good thing as it is very draining being the main care provider. With regard to that … This brief post is to inform you that Sue’s precious mother passed away on July 28; therefore, life has been more hectic than usual for Sue the past two weeks. If you wish to leave notes of sympathy and encouragement for Sue, please do so in the comment section for this post where she will read them. You also can visit her blog and leave condolences there. Although Sue and her husband are taking a much-needed break from the usual demands of life, a time which I hope will be restorative and healing, there will be a “Writing The Third Dimension” post this month. Sue sent it to me today and it’s now scheduled for August 27. It’s a good one – as usual. In September she will respond to comments and questions regarding the topic. It has been a stressful, sad time of late. My dearly loved father-in-law passed peacefully from this life in the wee hours of June 10 with many of us, his family, near. It was a special, quiet, reverent time, although very difficult until his pain could be brought to a manageable level again. Breakthrough cancer pain is horrible. The minister came to pray with him and us, which brought assurance to his soul, and a last broad smile to his face. Preparations have been completed … the service and reception scheduled for Sunday afternoon, June 14. Now you know why I have not posted much lately. My energy and focus have been mostly elsewhere. I will get back to some sort of posting schedule as soon as I can. Please check out the following information. We had known about asbestosis but had never heard of mesothelioma until my dad-in-law’s diagnosis. It is, and will be, affecting far more people than even, as yet, realize it exists – until it surfaces. I seem to be getting off to a slow start with my blogging this year, but I have ideas for making a few changes here although nothing is completely sorted out yet. Tonight I’m just going to share some thoughts with you. On Friday I learned of the sudden passing of a cousin on January 6. It was unexpected news; he was only 65. I didn’t know him very well because he was very quiet and so shy. Any time we met at some gathering – the last being after a funeral a few months ago – we didn’t have much to say to one another, likely because we both felt a little shy. He was a really nice man who usually had a little grin and a twinkle in his eyes. Ever wish you had taken more time to talk with someone? As I was writing the rough draft for this post (something I rarely do, but I wasn’t near my computer when these thoughts were coming to me) I was sitting in my living-room and occasionally gazing out the window. At one point an eagle came into view, soaring on the breeze. How magnificent those birds are, able to rise above it all and look at everything from a higher perspective. From that distance any situation looks small and manageable, meaning nothing can overwhelm when below and far away. We all need to see things that way, from a bit of a distance so that we don’t become overwhelmed by them. I do tend to get overwhelmed when I look at the big picture and must remind myself to take it one piece at a time. There are many things I want to do this year, or make as much progress in as I can. One thing I decided is to read the Bible through again, having done so only twice in my life. I feel it’s time again. I’ve procrastinated but on Friday (Jan. 9) I felt I had to read the book of Micah (in Old Testament), a reminder of the times we are in even now. After reading Micah I found a schedule for reading the Bible in a year. The first time I used a devotional guide to take me through and read Old Testament and New Testament scriptures each day until finishing all 66 books; the second time I read from Genesis through Revelation in the order they are found in the Bible. This time I’ll be reading it in chronological order. I’m late starting so yesterday was day one for me and I hope/determine to stay with it. Do you want to do this reading challenge with me? If you’d like to see the plan I’m using go to Bible Study Tools and click on Read, then select Reading Plans. You can choose among several schedules to read the Bible in one year, but there are other choices as well. I hope you will let me know if you decide to try any of them. I am also praying and hoping for a writing partner or group to help me get (and stay) on track with my writing, and someone I can encourage in kind. I’m very choosy and particular, so I’ll let you know what comes of that. Again this year I’ve seen where people have started their new year with a word. They either select a word they want to live by or they prayerfully wait for the word the Lord places on their heart for this year. It seems the word for me this year is POSITIVITY. It seems a rather odd word, but for me it relates to thinking positive thoughts, not allowing depression and discouragement to rob me, and to stay in forward motion with my goals. I also believe there is a Scripture that goes with it for me, and interestingly it’s one I posted in my blog December 31’14. This verse leaves no room for negative thinking and pity parties! Philippians 4: 8 Finally, brethren, whatsoever things are true, whatsoever things are honorable, whatsoever things are just, whatsoever things are pure, whatsoever things are lovely, whatsoever things are of good report; if there be any virtue, and if there be any praise, think on these things. That’s all for this time. Tomorrow (Monday) I need to do some tidying up here on my blog. I forgot to ask: Do you have a word for this year? I was talking with a friend about how sometimes similar things happen close together in unusually high numbers. What we were discussing was deaths of people we know. In my circle of family and friends there have been several since my aunt’s passing (age 75) in February — one in June (in his 80’s), one in August (age 97), one in September (in his 80’s) the same day my dad had his heart attack, and three deaths this month – a cousin in his 80’s, a former neighbour age 66, and a cousin age 65. Dad has recovered well from the heart attack, by the way, and attended five of those funerals, the last being three in ten days! I am glad for the wedding I mentioned in my last post; it was a lovely lift after so many losses. It was a sweet, touching, meaningful event, emotional for the bride and groom … and, of course, for sappy me, and a few others. The bonus was the weather. Friday we got a lot of rain, Sunday we got cool wind and some rain showers, but Saturday … Saturday was so warm and beautiful for an October outdoor wedding at an inn by the bay. It was a day much like my husband’s and my wedding day in late October many years ago, even a little warmer. Often by the end of the month it is cold, maybe even snow flurries, but there are the occasional Autumns that have remarkable weather. Since the wedding on Saturday the temperature has turned and rain is expected for much of this week, so that day was such a blessing – in many ways. Now on to other things. Today in place of a book review I want to share something I found that is so cool and enjoyable. Have you ever skipped rocks on a lake or pond? Have you really listened? How about when the water was frozen? Check out this video; it’s remarkable and amusing. I have tried to skip rocks, but I can’t say I’m very good at it, not like my husband. It takes several tries for me to get it right. How about you? Have you skipped rocks? What’s been your best rock skipping record? I was asked to read and review this book some time ago, and I’m glad I was given the opportunity. It was compiled by Thelma Zirkelbach, Barbara B. Rollins, Becky Haigler, and Robyn Conley. On Our Own: Widowhood for Smarties consists of almost one hundred stories, poems, and essays from sixty-seven different widows and widowers who are working through the grief of the loss of their life partner. It is a journey through the grieving process someone in that situation will understand, while not being too far removed from the appreciation of others not yet there. Some entries will put a tear in your eye, others a smile on your face, and a few may cause you to chuckle. Widowhood…a status with some deference but a role few seek. A new beginning usually greeted with dread rather than anticipation. The writers of this collection express the range of emotions at the loss of a spouse but the overwhelming message is affirmation of the strength they find to create new lives after deep loss. Widows and widowers will read these stories and poems with knowing nods, sighs and smiles. Other readers will find insight into a common human condition and perhaps courage to face their own unsought new beginnings. As the subtitle suggests, this is widowhood for smarties, for those who acknowledge the pain of loss but who are learning to live in spite of it, even to build on it. It’s obvious there was much thought put into the creation of this book. Along the bottom of every page there is a continuous appropriate offering of quotes, adding to and complimenting the main content. This anthology gives a well-rounded taste of the experience of widowhood, the deep profound loss, the pain and grief, but it also is encouraging and hopeful. On Our Own: Widowhood for Smarties is not only for the grieving of the loss of a relationship, it is a glimpse into the experience and definitely a good read for anyone. 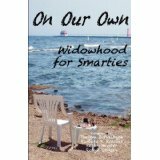 You can find On Our Own: Widowhood for Smarties on my BUY THE BOOK! page.